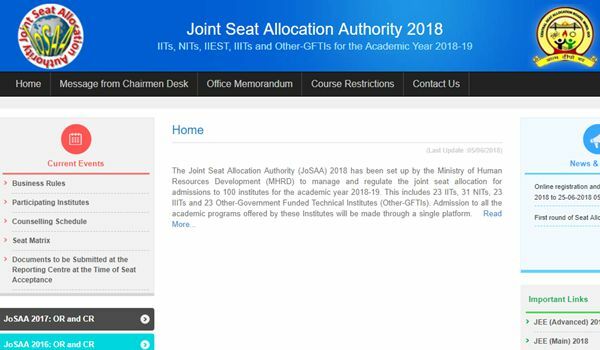 JoSAA 7th Round Seat Allotment Results 2018: Joint Seat Allocation Authority announced the round 7 seat allotment result on its official website, josaa.nic.in from July 18th. Candidates can navigate to the JOSAA portal to check the seat allotment result. JOSAA has announced the has Final round seat allotment result for JEE Main and JEE Advanced 2018 qualified candidates. The JOSAA Seventh Round seat allotment 2018 is declared today, 18th July. So, aspirants can proceed to check the details without any delay. The following article is composed to give the additional information regarding seat allotment of JOSAA. Hence hopefuls can go through it for more understanding. The JOSAA seat allotment will be done on the basis of their rank obtained in the examination. JEE Main and JEE Advanced qualified aspirants can get admission in IITs, NITs, IIITs, and GFTI’s. Qualified students can fill their choices of courses/ colleges. The JOSAA has done with the certificate verification and counselling process during 15th June to 25th June. The mock allotment results were published by the JOSAA. The students have reported the reporting centres until 2nd July. Students those have confirmed their seats have to report at the helpline centre. During the allotment process, students can have 3 options, Freeze, Float or Slide. Visit the JOSAA official website, josaa.nic.in to check the details. Click on the ‘Round 7 Allotment Result. Students those have confirmed the allotted seat has to Download JOSAA Seat Allocation Order (Provisional) and also the e-challan for payment of the acceptance fee. SC, ST, Gen-PwD, OBC-NCL-PwD, SC-Pwd and ST-PwD category candidates have to pay the acceptance fee of Rs. 20,000. The other candidates apart from this list have to pay Rs 45,000 as the acceptance fee. Where should a candidate report after seat allotment? I accepted a seat in first round and now hoping for a better seat. Can I withdraw from the process? If there is/are subsequent rounds of seat allotment, you are allowed to withdraw and vacate the seat. But not if that is the final round. For example, if there are seven rounds of seat allotments, then up to the end of sixth round seat acceptance period, withdraw option can be exercised. Once seventh round allotment is done, you will not be allowed to withdraw. What are the meanings of the terms ‘Freeze’, ‘Float’ and ‘Slide’? ANSWER: These three options allow a candidate to either retain the seat allocated or to opt for a change in seat as per candidate’s preference in any of the institutes or in the same institute in which the seat is allocated. Freeze option: Candidate is content with the allocated seat, accepts it and is not interested in participating in further rounds of seat allocation. This candidate will NOT be considered in subsequent rounds of seat allotment. Float option: Candidate accepts the offered seat and wants to opt for a seat in an academic program of higher preference in any Institute if offered in the subsequent rounds. If he/she does not get a seat in a higher preference program, he/she will continue with the currently accepted academic program. This candidate will be considered in subsequent rounds of seat allotment. Slide option: Candidates accepts the offered seat and wants to opt for a seat in an academic program of higher preference within the same Institute if offered in the subsequent rounds. This candidate will be considered in subsequent rounds of seat allotment. I have got 224 marks in jee main paper 2. I had applied for B.Arch in NIT. My general rank is 5796 & obc rank is 1488. But I didn't get any seat in these 7 rounds. Will I get seat in NIT through special rounds?? SIR iam K. VARDHAN 73marks in jee mains in OBC catogere.iam not qualified in 7 round counselling.pplease help me sir How To get spot addition seat. tell me information please sir reply Ian waiting your answer please help me sir. Registration from 24th July to 26th July.